Recientemente se le otorgo al Condado de Marin el estatus de amigable con las personas mayores por parte de la Organizacion Mundial de la Salud (OMS) y la Red de Ciudades y Comunidades Amigables con las Personas Mayores de la Asociacion Americana de Personas Retiradas (AARP por sus siglas en ingles). Ser parte de esta red sirve para confirmar nuestro compromiso de hacer de Marin una comunidad grandiosa donde las personas puedan vivir a medida que envejecen. La informacion recolectada mediante este proceso de encuestas informara sobre el desarrollo de un plan estrategico para alcanzar un Condado de Marin Amigable con las Personas Mayores. Por favor, tome esta encuesta solo si tiene 60 anos de edad o mas, o si esta representando a un individuo o a un grupo de adultos de 60 anos o mas. Esta encuesta es voluntaria y anonima. Le tomara alrededor de 15 minutos completarla. La fecha limite para completar la encuesta es el 13 de marzo de 2019. Si tiene alguna pregunta, por favor contacte a la linea de Asistencia e Informacion del Condado de Marin al (415) 457-INFO (4636) o envie un correo electronico a 457-INFO@marincounty.org. Marin residents age 60 and older and those who work with older adults are encouraged to take the Age-Friendly County of Marin survey. The survey is also being distributed in hard copy throughout the county (click here to download PDF), including senior centers, libraries, community centers and nonprofit organizations that serve older adults. Results of the survey will help to inform development of a strategic plan to make Marin more livable for people of all ages. In August 2018, the Marin County Board of Supervisors unanimously approved submitting the County's application for membership in the World Health Organization (WHO) and AARP Global Network of Age-Friendly Cities and Communities. In September 2018, the County was accepted into the network, joining an expanding worldwide movement that is striving to better meet the needs of the growing population of older residents. 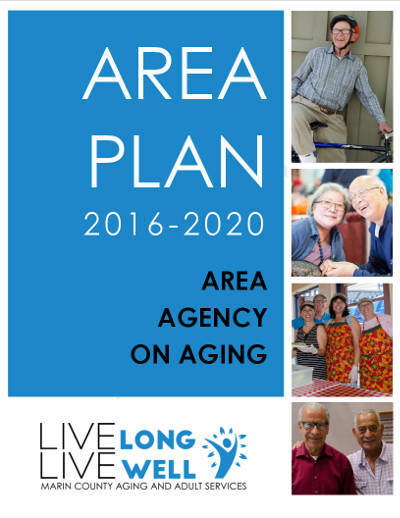 As a member of the WHO and AARP Global Network, the County is making a five-year commitment to assess the age friendliness of County departments and unincorporated areas and create and implement a strategic age-friendly plan. Thank you for your ongoing support of an age-friendly Marin. Marin County Aging and Adult Services (AAS) acts as the Area Agency on Aging (AAA) for Marin County, under a framework and funding put forth in the Older Americans and Older Californians Acts. The AAA is the leading planner, administrator, and funder of services for persons over 60 and family caregivers in Marin County. View the Area Plan here. For information about services for older adults and their families in Marin, visit the Community Resource Guide or call the Information & Assistance hotline at (415) 457-INFO (4636). The Board of Supervisors established the Marin County Commission on Aging to advise the Area Agency on Aging on the needs of older adults. Visit the Commission on Aging page for more information and meeting agenda/date/locations.